It was an impressive attacking performance against Burnley on Sunday and a great team effort. Adam Lallana was a surprising inclusion in the starting line-up for us, but he played out of his skin to get us the three points. One moment shone out amongst them all though – his clearance-preventing tackle on the edge of their box, which eventually resulted in Sadio Mané curling in our second. Speaking to Liverpool FC, the 30-year-old said: “I just thought the ball was there to be won”. Thanks to Lallana’s tireless performance against the Clarets in that 4-2 win we’re back to within a point of Manchester City. Many of us were somewhat taken aback by his return to the starting line-up as he’s barely featured all season. But he has shown great mental fortitude to overcome his injury situation. The Englishman went on to say: “Three points is obviously the main thing. At the end we made it a little bit nervy for ourselves by conceding, but [they were] tough conditions. “No excuses, it’s the same for both teams, but I think both teams would rather it wasn’t blowing a gale out there. Adam was one of the star performers on the day – we’re going to need more of our fringe players to step up and put a shift in it like that if we’re going to oust City from top spot. 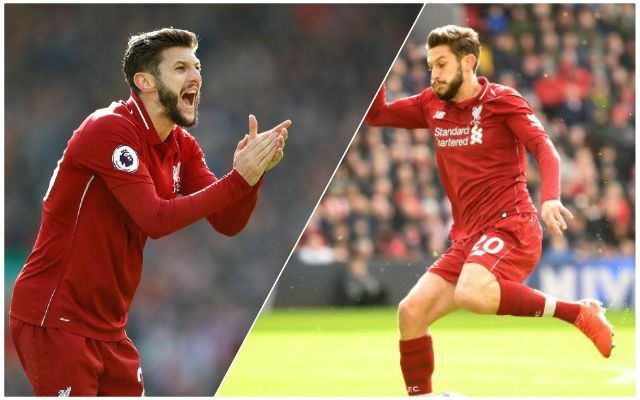 Before the game, Klopp stated that it was Lallana’s good work in training that earned him a place on the pitch. The midfielder will be hoping that Sunday’s game is just taste of more to come. During the conversation with Liverpool FC, the midfielder revealed that, “It’s been a tough 18 months to two years for me”. “I’ve not been fit consistently for a while so it’s nice to have been fit for eight or nine weeks now and I just feel I can benefit off that rhythm. That’s what we like to hear lad! Let’s keep it up, Reds!